Nathaniel from Circulation Services shares this review. This isn’t the kind of book I usually read. It’s definitely not the kind of book I usually review. But my parents have told me (politely, but firmly) to get my boxes of stuff out of their garage, so I’ve found myself turning to books like Unstuff Your Life! in hopes they’ll help me out. Surprisingly, they do! And of the ones I’ve read, Mellen’s book has stuck out for me in that it offered a lot of good-humored, practical advice, useful even for a twenty-something who lives in a small apartment. Andrew Mellen is a professional organizer. He works with clients ranging from business owners to homemakers, and in his book he writes as though you, the reader, are one of his clients and he’s working through everything with you. His focus is on the psychological causes of clutter, and he makes a point of reiterating, “You are not your stuff.” He asks questions that prompt you to think about the way you think about your possessions. He reminds you that you can’t take it with you. He relates his conversations with other clients and shows how they worked through their mental stumbling blocks. You might be thinking “Wait, I thought you said practical advice?” Well, he gives you that as well. The book is separated into specific areas to tackle – Kitchen, Paperwork, Mementos, and so on – and each section contains detailed instructions, checklists, and other information that you can use even if you don’t follow Mellen’s instructions to the letter. For instance: the cleaning tools you need before you start on a certain room, a checklist of things that might go in a car, and tips, like reminding you to sort stuff first and then buy storage, not the other way around. If you have a garage full of boxes to deal with (or any clutter problem) and want some help with it, Unstuff Your Life! is a solid choice. 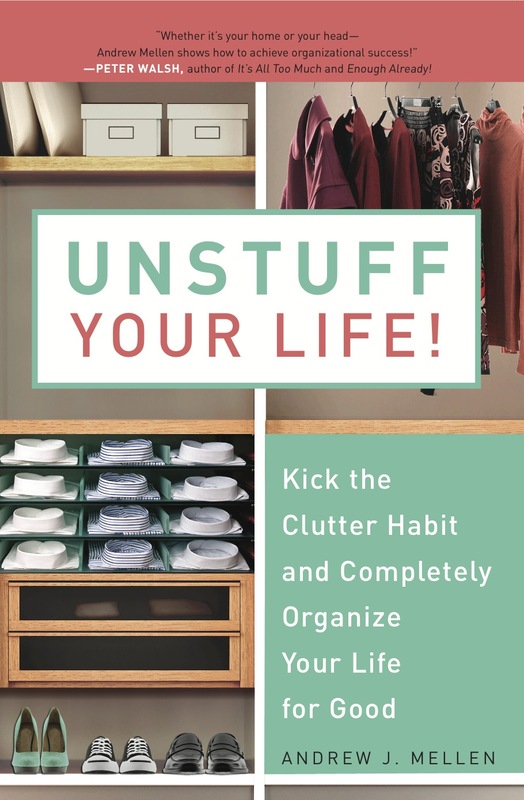 Check the WRL catalog for Unstuff Your Life! This is a great recommendation. I’m sure my family would think I need this book! I think I need this!! My bookcase is currently double-rowed (not a word, I know), and I bought five more today with no place to put them, what a dilemma. This is great! I’ll have to add it to my stock of books about getting organized, if I can find them.